Do you still have your record (LP) collection? Do you even know what a record is (for my younger Subscribers)? I remember listening to my father's record albums, including Barry Manilow, Neil Diamond, the BeeGees, and quite possibly Peter Allen! Experts believe that it is impossible to replicate the richness of sound in digital format comparable to the original album. Amazingly, record players and LP sales are making a distinct comeback. Vnyl is a company that has grown by leaps and bounds and provides subscribers with curated record collections; You choose how many you want per month and they will send you their selections according to the genre you specify. I presume what they realized is that their users needed a great way to play these records, possibly one that connects to their systems in familiar ways. 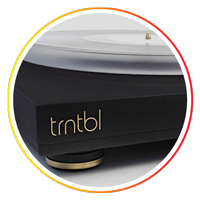 Therefore they created the Trntbl which is a gorgeous, sleek record player that connects wirelessly to your systems (bluetooth, Airplay, and even Sonos). It is available by pre-order so make sure you get one play your old albums through your new systems!